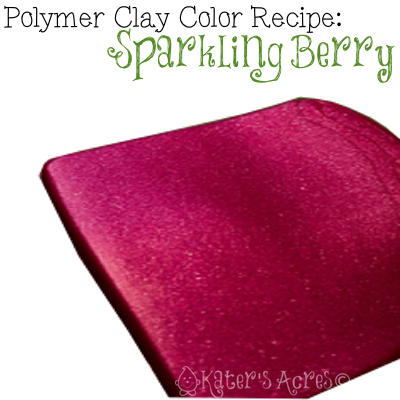 This polymer clay color recipe coordinates with the Winter Blooms polymer clay color palette. Get the color palette here. Notes: Ultramarine Blue is very strong. For a brighter color add more Fuchsia. For a deeper color add more Ultramarine Blue. You can add more pearl than shown, however know that adding more pearl will also lighten your color significantly. Hello, thank you so much for providing these awesome blend recipes, I love to play with my clay colors. Often times, I create my own blends. I wanted to try this out because it looked so luscious, unfortunately my Winter Berry turned out to be purple too. As if you blended one part Premo Pearl to one part Premo Purple. I used all Premo colors and mixed it twiced for the project I am working on. It is a stunning purple and I will try this recipe again but I am going to try 2 parts Fuchsia. Thanks for the comments, I will recheck my notes on the recipe in case there was an error. It may have been Premo’s old clay recipe & colors before they changed them in 2014, that could have made a difference. I will go home and duplicate it & repost the results. In the meantime, let me know if the 2 parts fuchsia works. My apprentice helped me make sparkling berry, but it turned out purple. I had sculpey fuchsia instead of premo fuchsia. Is there a way to fix it? We used 2 oz of each color. Thanks. I’m sorry the color didn’t work out for you. The recipe is written for Premo and I know they are two different clays and I’m sure the colors are slightly different in their composition which could be the difference you’re seeing. I would try adding some RED maybe? See if that helps. I was really happy to see thes color recipes!!! I get really bored with the same things so thank you! I was also very happy to see that you don’t charge for these. So many sites just try and nickel and dime us and its nice to see that some things are still free! Thank you!!! You’re welcome Michele! I have OODLES of freebies here on the site. Enjoy your claying experience!